New 12-sided pound coin sparks the Marie Curie One Pound Challenge, asking savers and spenders alike to raid their piggy banks for old pound coins. Marie Curie is challenging savers and spenders alike to raid their piggy banks, check behind their sofas and clean out their cars, as part of the charity’s new fundraising initiative to help people use up their old round pound coins before they lose their legal tender status later this year. As the new 12-sided pound coin has now entered circulation, Marie Curie is challenging people to collect their old round pound coins between now and 1 October to donate to the charity, ahead of the coins being withdrawn from use on 15 October 2017. Amy Llewellyn, Marie Curie Community Fundraiser for Dorset said, “Lots of people will be looking to use up their old pound coins before the deadline and we thought it would be a fun way for people to raise vital funds for Marie Curie. 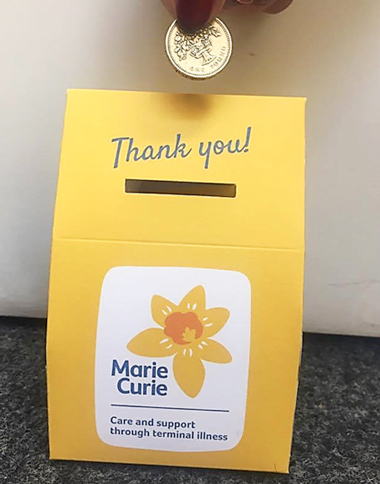 To receive a cardboard collection box to start collecting your old £1 coins contact Amy on 01884 703537 or email amy.llewellyn@mariecurie.org.uk.